20' x 20' tent, filled with 5' round guest tables will accommodate 32 - 40 guests. This tent can be installed on asphalt with the use of 275# weights. Premium waterproof UV reflective tent top. Side curtains are rented separately. 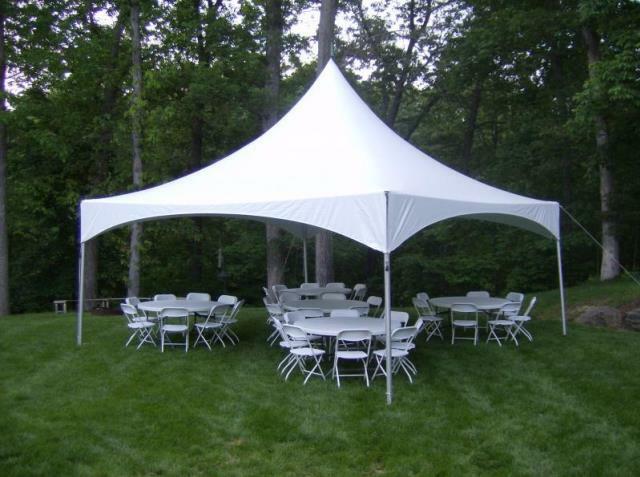 This tent style has 20' pole span with a dramatic high peaked tent top. * Please call us with any questions you may have about our hi peak tent 20 x 20 foot white rentals/sales in State College, serving Central Pennsylvania.